Luke 9:28-29 Now about eight days after these sayings Jesus took with him Peter and John and James, and went up on the mountain to pray. And while he was praying, the appearance of his face changed, and his clothes became dazzling white. Göreme district, Nevşehir Province, Turkey. Click here for more Göreme district churches. A large portion of the Eastern Roman Empire spoke Greek and by the seventh century it was the primary language used by the Byzantines. The Byzantine Empire extended eastward from Constantinople and included Asia Minor where Greek speaking Orthodox Christians often had to seek protection from invading tribes. In a region known as Cappadocia, the ash and lava of a volcanic eruption created rock formations that were soft and could be carved easily. By carving into the rock, Christians hollowed out spaces that would shelter them from the elements and offer protection from invaders. The soft rock also was carved out for churches. 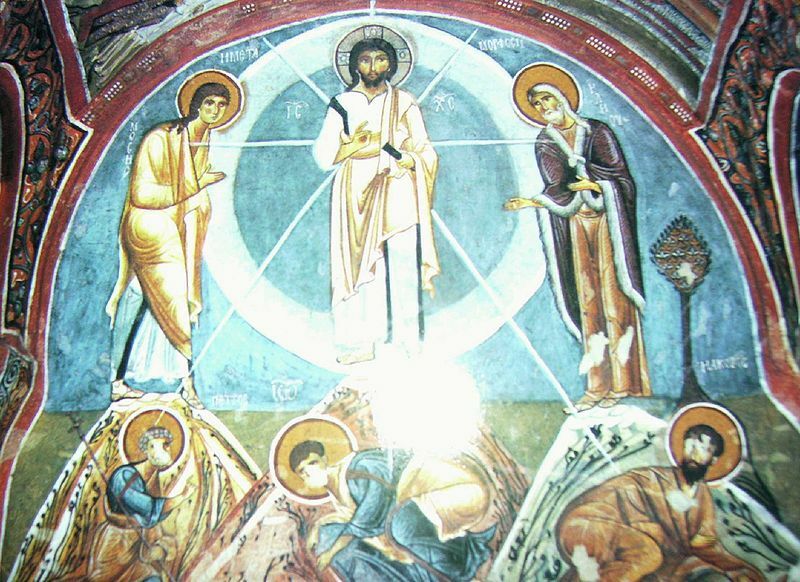 In a monastic compound known as the “Dark Church,” The interior walls and the ceilings are covered with frescos and among the paintings is “The Transfiguration.” In it, Moses and Elijah are with Jesus in an event interpreted as a revelation that Christ is the fulfillment of the law and prophets. Moses represents the law and often he is shown holding the Torah or a stone tablet. Elijah represents the prophets. In this fresco, neither Moses nor Elijah has been given an identifying symbol but we can assume the gray-haired bearded man is Moses and the un-bearded figure is Elijah. Mt. Tabor is the traditional site of the transfiguration but other places have been proposed. One of the suggested sites is Mt. Hermon which has three distinct peaks and in paintings of the event often three peaks are shown; Christ is always in the center. In the “Dark Church” fresco, Moses is standing on the right peak and Elijah is on the left. Below them are the disciples kneeling and crouching. At the bottom left is Peter with white hair and a beard. He is pointing upward toward Christ. The disciple John is depicted in the center as a beardless youth (his face is partially obscured by damage) and James is to the right with brown hair and a beard. Linear rays indicate a direct connection between Jesus and each of the figures. The “Dark Church” is so named because it has only a small opening (oculus) for light, thus the interior is dim.